Happy almost Super Bowl! Super Bowl XLIX will be an epic battle not only between the Pats and the Hawks (go Hawks!) but also between the snacks and your gluten-free diet. Your ability to resist will be “deflated” when you see the sliders, the nachos, the mini pizzas….so what do you do? YOU BRING YOUR OWN AMAZING APPS. Interception! You bring your own gluten free and dairy free snacks that are so delicious that those once-tempting mini pizzas will be passed up for your paleo treats. Today we have some amazing and (mostly) paleo-friendly snacks that will help you BEAST MODE past tempting non Paleo appetizers. These meatballs are a paleo-friendly version of my mother’s amazing crock-pot recipe. Thanks mom, for allowing me to steal the recipe! 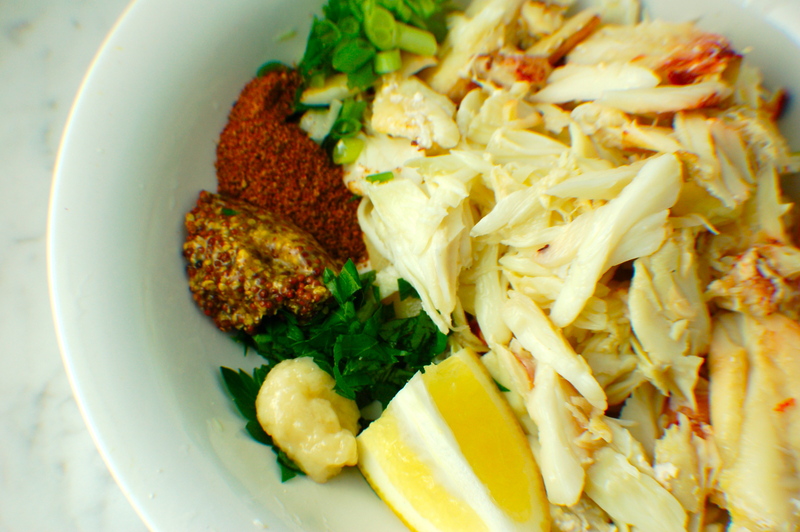 Using your hands, mix beef, salt, pepper, onion, parsley, almond flower together in a bowl. Form into uniform, golfball-sized meatballs. Heat olive oil over medium heat in a salute pan. Brown meatballs on all sides (I turned three times for about 4 minutes each) in batches. 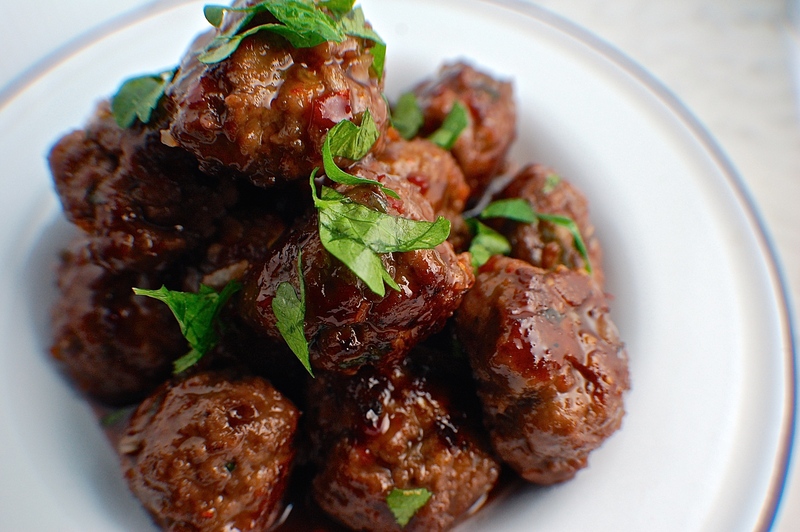 Once all meatballs are seared, place all meatballs in a crock-pot or enamel pot over low heat and cover with chili sauce, sambal oelek and grape jelly. Heat until cooked through, about 10 minutes, mixing meatballs and sauce every few minutes. 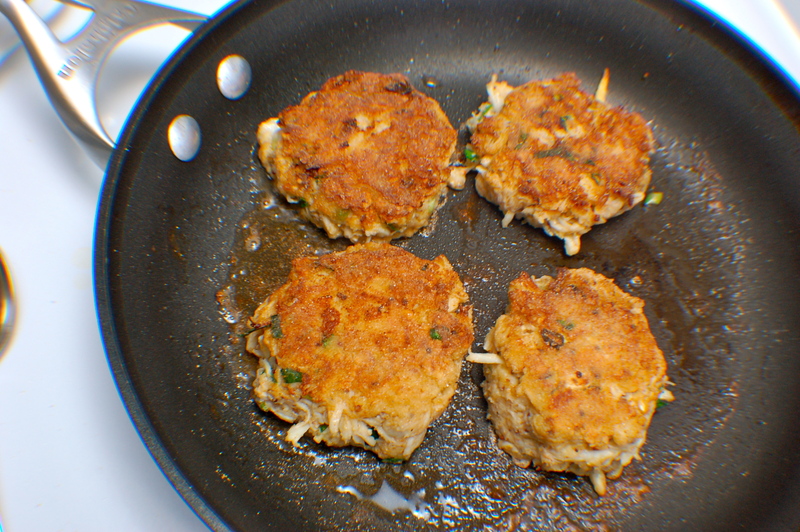 Meatballs are best when cooked in sauce, refrigerated overnight, then re-heated the next day. Can also be frozen for 1 week and re-heated. Turkey Bacon Asparagus. Eat your veggies!! 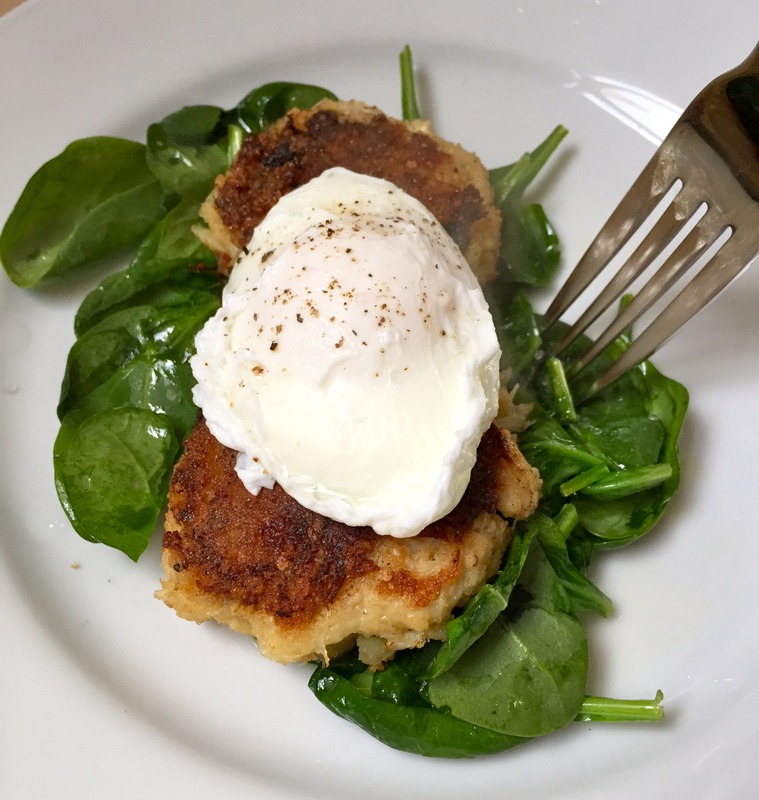 Need a way to get the kids or yourself to eat greens? And be paleo-friendly? Repeat after me: wrap in bacon. WRAP IN BACON. 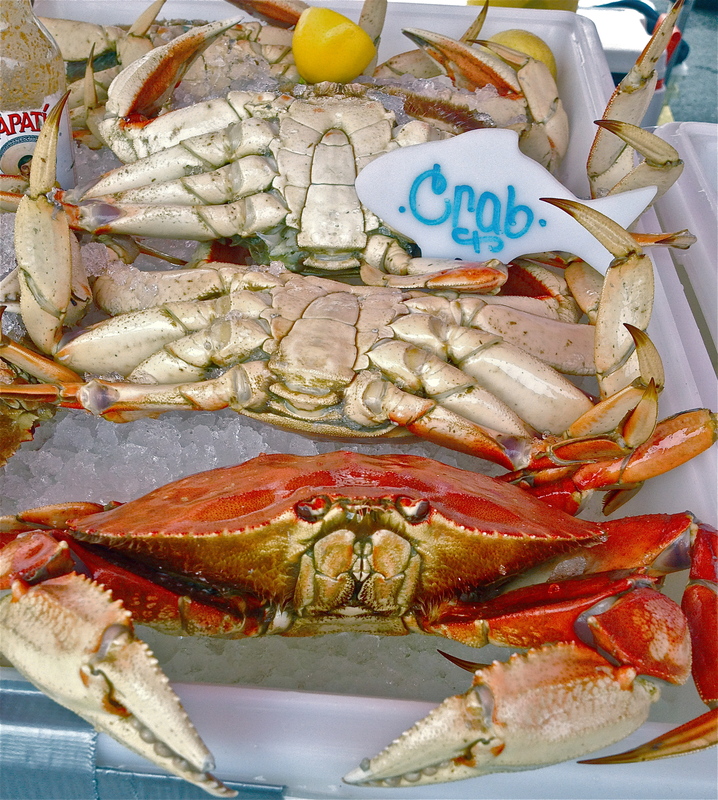 These delicious little buggers are so easy and can be prepped for party-time beforehand and cooked right before serving. Turkey bacon makes them healthier than traditional bacon and the maple sugar adds sweet to your salty. A super crowd-pleaser! Preheat oven to 350 degrees. 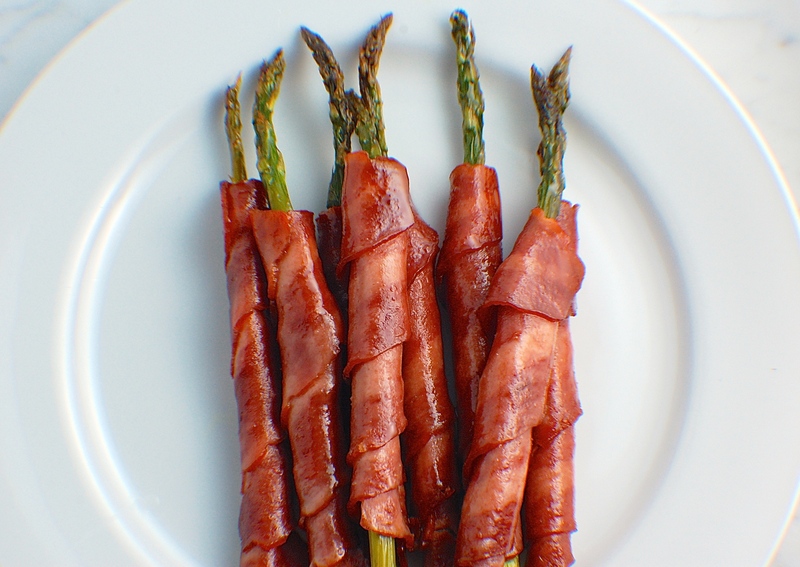 Wrap asparagus in bacon and place on a cooking sheet. Mix olive oil, salt and sugar in a small bowl. Brush olive oil mixture over asparagus and bake in oven until browned, about 18 minutes. Serve immediately. 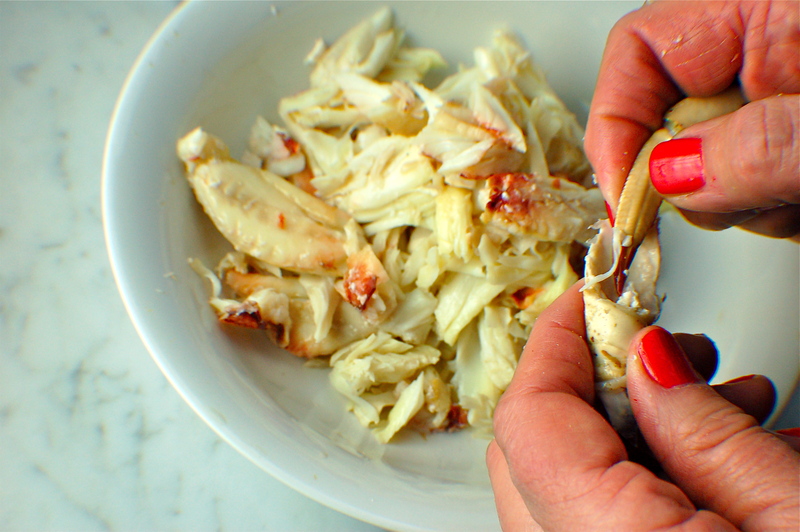 Pat yourself on back for easy paleo snack. 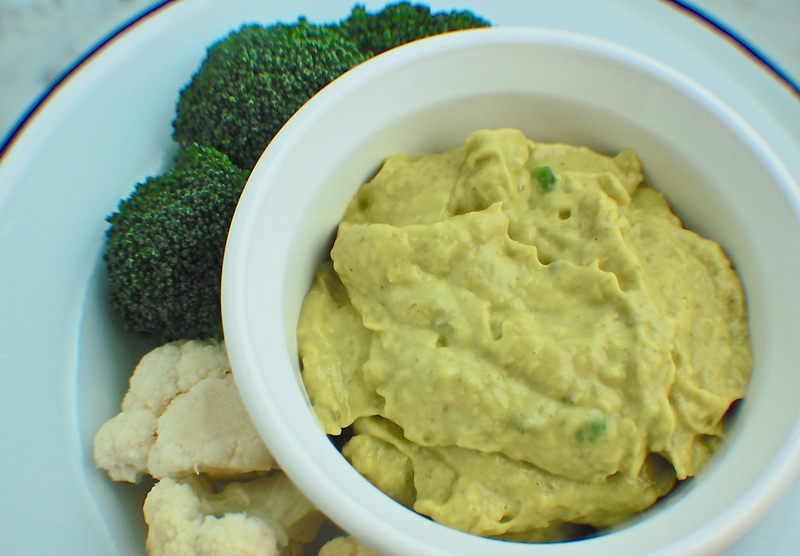 This dip is creamy, spicy and chock-full of vitamins, healthy fats and minerals without dairy or guilt. This recipe is a version of Green Goddess dressings, but eliminates the need for the traditional ingredient of yogurt. Blend all ingredients together in a blender or Vitamix (preferred). 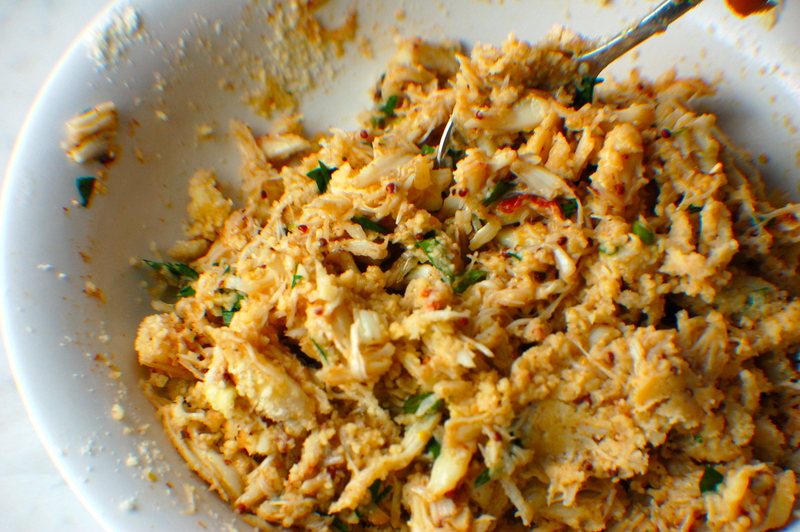 Serve with veggies for a paleo-friendly snack. 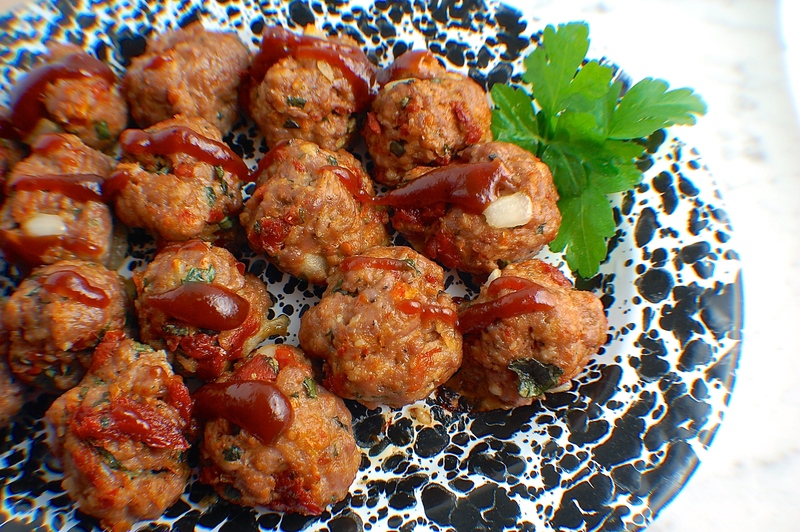 Paleo Lamb Meatballs with sun-dried tomatoes and basil. Plate by Crow Canyon Home. These little gems are so delicious if I do say so myself! 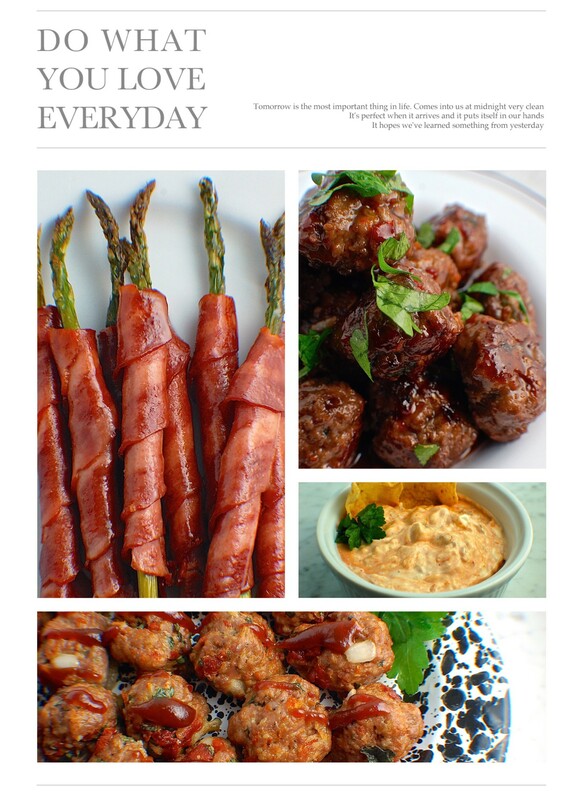 Similar to mom’s meatballs, these can be made ahead, frozen and reheated for game day. Pre-heat oven to 350 degrees. Using your hands, mix all ingredients except BBQ sauce in a bowl. 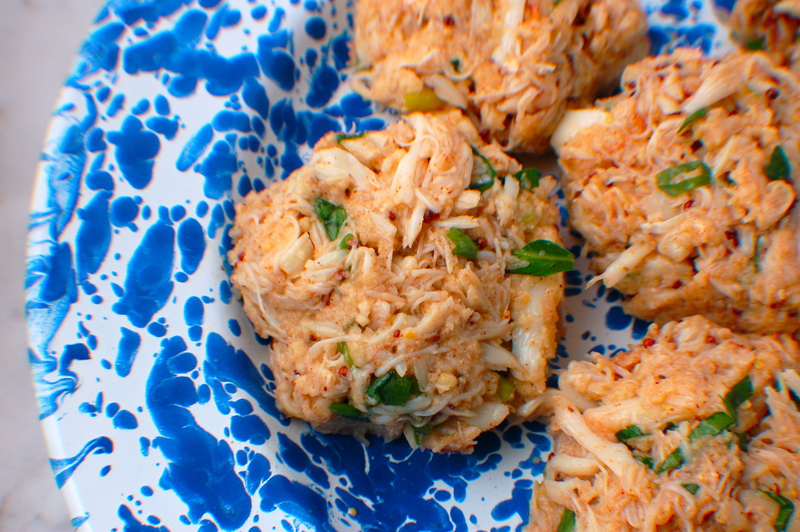 Form into uniform, golfball-sized meatballs. Place on a baking sheet and bake in oven until no longer pink in the middle, about 15 minutes. Serve alone or with Sweet Baby Ray’s BBQ sauce. Can be pre-made and frozen before baking 1 week in advance. 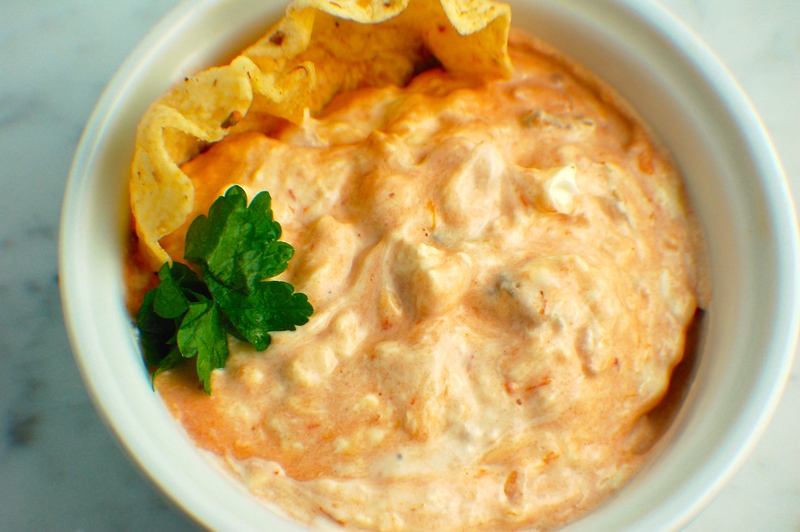 Alright, so this isn’t Paleo, but it’s gluten-free and just about the easiest, most delicious dip I’ve ever had. This is my mom’s recipe, and famously named “Pig’s Guts” by my sister. 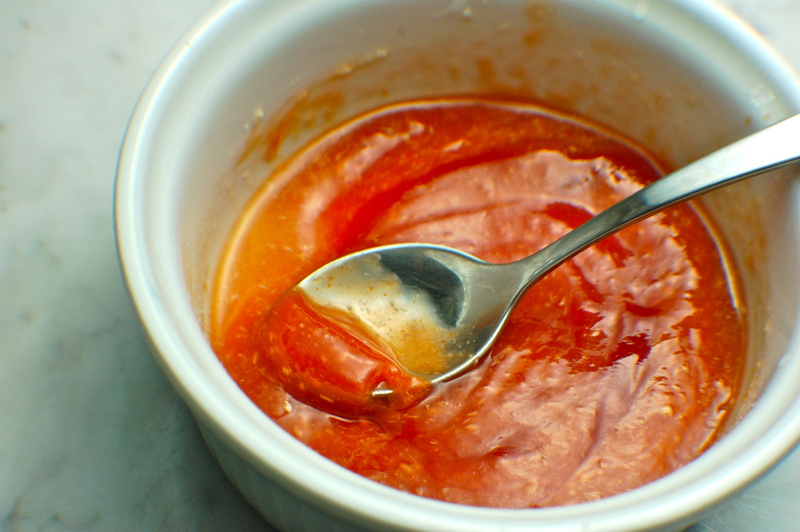 Heat up cream cheese in microwave 10 seconds at a time until hot, then mix in hot sauce. Serve with tortilla chips. So easy! 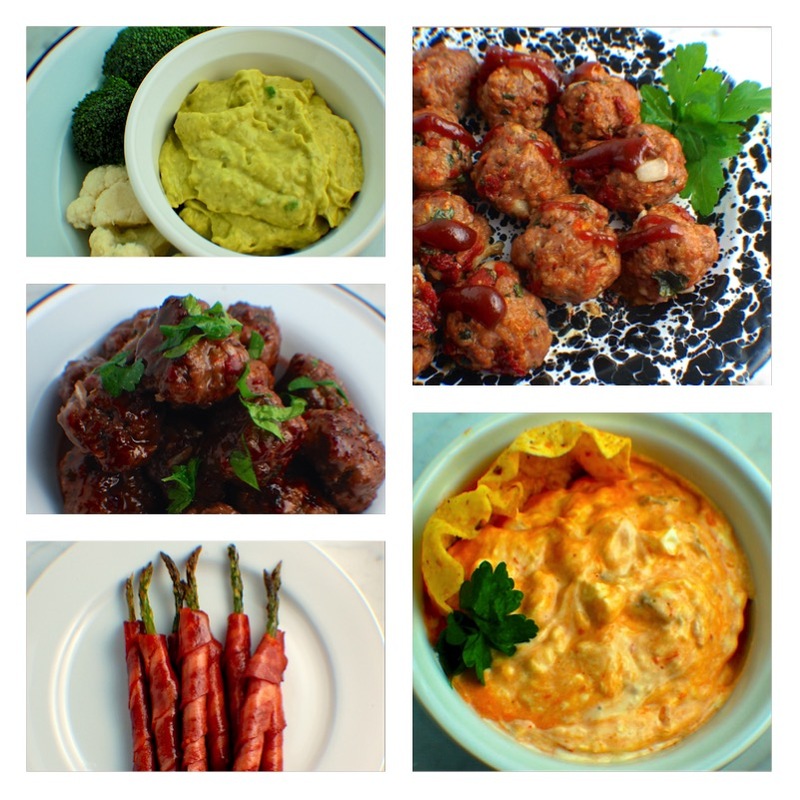 With these simple recipes, you can satisfy your cravings for all the delicious Super Bowl food without compromising your healthy-living gluten free/paleo lifestyle. So whoever you’re cheering for on Super Bowl Sunday (Hawks, right!? 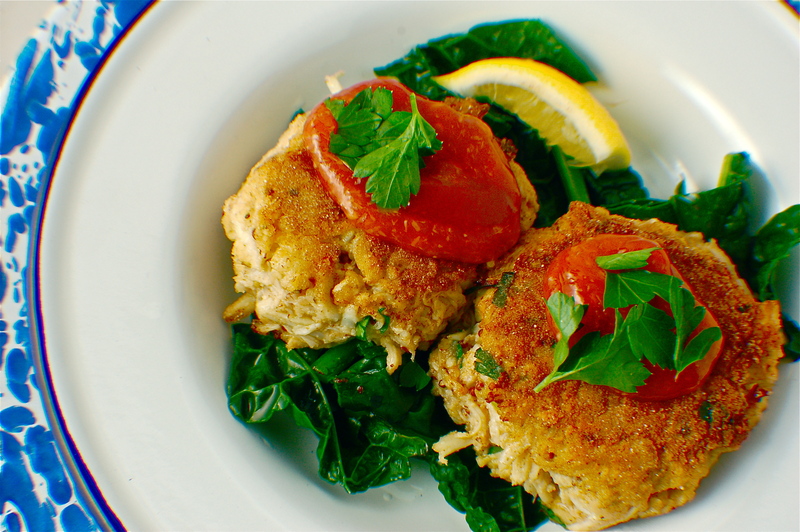 ), you can enjoy the cheering you’ll receive for showing up with your gluten-free appetizers!